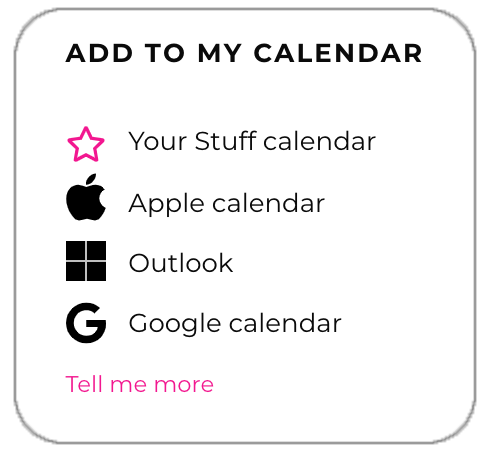 Stuff helps adding invitations and events to your preferred calendar. To make sure no events are forgotten. On Stuff you have the following options to synchronise with your preferred calendar tool. When you receive an invitation to a private event, you can add the event directly from the email you receive. Depending of the email program and platform you are using, this is done more or less automatically. When you receive a private a link to a private invitation you will have the same options after having RSVP'ed to the event. You can choose to add to you favourite Apple, Outlook or Google calendar with a simple click. This does not require you to login and no information of your usage is being stored. Alternatively you can subscribe and add to your personal Stuff calendar. Subscribing to your personal Stuff calendar gives you the most value of Stuff. All events are added automatically to your preferred calendar tool with a single click. When events and invitations are updated it will be reflected in your calendar immediately. You find your personal calendar link on your profile page when logged in. Drop us an email on support@stuff.li.